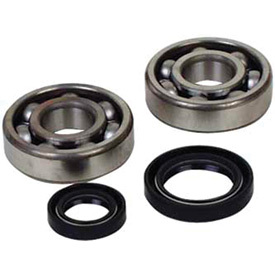 The Hot Rods Crankshaft Main Bearing and Seal Kit is a set of engine components that stand out thanks to their ease of use and precision fit for your four stroke and two stroke applications. In this kit you get a set of main bearings and seals that are made to exact OEM tolerances so you get components that are interchangeable with OEM and other Hot Rods parts. With the quality Hot Rods puts into their kits, you’re crankshaft will turn true for seasons of riding. fits great and works awesome in my 1991 honda cr125. easy to install.bearings and seals look to be made of good quality materials i would buy this brand again and would highly recommend to everyone. The fitment was perfect. Seems like a really beefy and well built bearing. Great product! Works as it should. Can't really say if quality is better than others. They are all pretty close to the same. I have used different brands before, but the crank bearings have never been the point of failure for me to split the engine cases. I always but new ones in if I have them open. Have a lot of hours on these bearings.change them out at 200 hours and the crank.make sure ya freeze them first and I use a press! Perfect fit, install is easy when done properly. Put bearing in freezer overnight, heated case in oven, dropped right in! Can't verify performance or longevity but have no doubts. Have had zero issues with this product, holds up well. Awesome deal, never had a problem with with hot rods products. Highly recommended. best deal i could find for the money. bike runs great now quality bearing set. thanks again rm. As good as stock at a better price. So far no issues after 20 hours on the new bottom end and bearings, only time will tell but I've used these before on other bikes and had no quality issues. Hot Rods Crankshaft Main Bearings are where its at. Solid build and made very well. Does what it's supposed to. Can't go wrong here. 75 Hours on hot rods crank & this bearing kit. Installing new piston. No play in these bearings at 75 hrs. Will definitely buy again. Rebuilding your dirt bike engine, use this kit. Quality product at a great price. i do 10 hours of riding in a weekend, Engine was fresh and this thing shattered putting metal all through my rebuilt engine. Used this bearing to save 20$, now I am going to be another 10 hours fixing this right instead of just using quality bearings the first time. Please learn from my mistakes and don't buy hot rods products, almost everything I have purchased from them has prematurely broken, this has been my last straw and I will never purchase hot rods products again. Good packaging and product! No issues with this from start to finish! About 50hrs on lower end bearings so far no troubles. Still running strong after 75 hours on pratice bike. These bearings are better than stock ones. And the fit is perfect every time. All bearings are not created equal. I was actually impressed with the hot rods crank bearing kit. They arrived with some grease already applied, which is good in my book. Install was easy, fit was perfect. It's been almost 2 years since I installed. I recently checked end play of the crank when I had a flywheel go bad. (Bad magnets) I thought maybe the crank was bent out of spec which could have caused the flywheel to contact the stator. Anyway crank end play was well within spec. So these bearings held up even thru an unbalanced flywheel. Will buy again! Great Kit it did what it was suppose to! Good seals and they are a nice tight fit. Perfect fit. Fits like OEM, I have order 2 different sets for 2 different bikes and they both fit and last longer than OEM. A great upgrade from stock. Great product and once again, Rocky Mt. sells it for less. No need to spend more. These guys fit awesome and will do the job as well as any others. Replaced OEM with Hot Rods and am very satisfied. Just followed the Honda manual for the rebuild, and everything fit just right. No additional adjustments or shims needed. So far it has served well and have five hare-scramble races on it. Power is consistent and runs great. <br>Used this kit with the replacement crank and rod. Fits perfectly. You will need a press to remove and install the new bearings. Quality seemed to be that of OEM and have five races on mine so far with any problems. I would definitely use these products again. Easy install good quality bearings. They fit fine and have worked so far. Dose this bearing kit come with 1 or 2 bearing's? BEST ANSWER: 2 Bearings for left and right side of crank. Work good. I have used them quite a few times and haven't had any failures. Ones with 2 main bearings and 2 seals, everything you need to get the job done. it comes with 2 bearings and both your crank seals. its a great kit. It comes with two bearings. Worked great for me. It comes with both bearings. I believe it came with two. For this model should come 1bearing& 1 seal & a bushing /bearing? BEST ANSWER: Not sure if the bushing/ bearing comes with it from memory but I would stick with OEM. The seals popped out on both sides.